You'll be £19.99 closer to your next £10.00 credit when you purchase In the Peninsula with a French Hussar. What's this? Order within the next 5 hours, 5 minutes to get your order processed the next working day! Albert Jean Michel de Rocca gives a riveting account of the Peninsular War from an entirely different perspective. Albert Rocca was a junior officer in Napoleon's 2nd Regiment of Hussars, and describes such early events as the march to Madrid and Napoleons entry into the city, followed by the subsequent battles and the pursuit of Sir John Moore to Corunna. For him Spain was not just alien but totally hostile as well. Where British chroniclers of the Peninsular berate the qualities of the Spanish armies Rocca knew that his life was constantly under threat from not only the enemy armies but also from a population who would kill an unwary or isolated Frenchman in a moment. The Peninsular War was a bitter struggle by the Spaniards to liberate their country from the French invaders and in this essential memoir Albert de Rocca describes the fighting in uncompromising detail. De Rocca's account was first published in English in 1815. This book is the unabridged presentation of that work with a new introduction by Philip Haythornthwaite and additional maps. 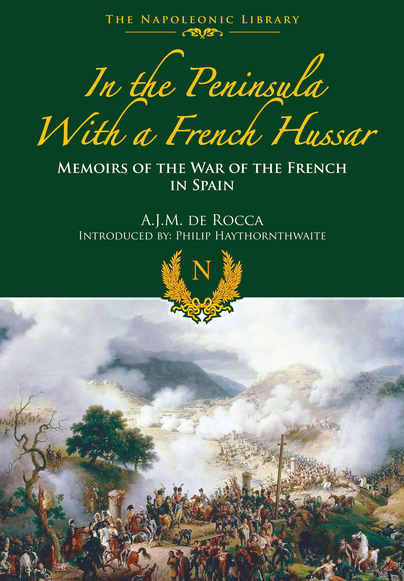 De Rocca was not involved in any of the major battles in the Peninsula and that is the most valuable part of this book. It is a rich insight into all the other tasks performed by light cavalry in support of an army of occupation. Garrison duties, scouting, escorting and dispatch carrying all feature in the day to day tasks which De Rocca carried out. The underlying theme running through all his duties was finding enough to eat for himself and his horses. For the general reader I would recommend this book as a jolly good read maintaining interest from beginning to the end. For the military buff I can recommend this unique insight into the effects of the Spanish Guerrillas on the front-line fighting ability of the French as seen through the eyes of one who was there. First published in French in Paris 1814, in English 1990 this book presents an account of the Peninsular War from a somewhat different perspective. The writer was a junior officer in Napoleon’s 2nd Regiment of Hussars, and he presents early events in the conflict, such as the march and then Napoleon’s entry into Madrid, as well as subsequent actions, including the pursuit to Corunna. For De Rocca Spain was a totally hostile country, where he was constantly under threat from both the Spanish troops and civilian population. He describes the fighting in fairly uncompromising detail, providing the reader with a vivid account of the Peninsular War. Noted historian Philip Haythornthwaite has provided an interesting introduction to the text and there are four maps. Albert Jean Michel de Rocca was born in Geneva in 1788, but joined the French Army. Whilst serving in the Iberian Peninsula he was seriously wounded. Back in Geneva, he had an affair with Germaine de St Stal who famously opposed Napoleon and was exiled. Eventually the couple married and after Waterloo they settled in Paris. As well as his Peninsular War memoirs, de Rocca also wrote about the failed British attempt on Walcheren in 1809, entitled La campagne de Walcheren et d'Anvers.